PORT OF PALM BEACH- As a band played and media, dignitaries and invited guests looked on, the Grand Classica made its debut appearance at the Port of Palm Beach April 13. 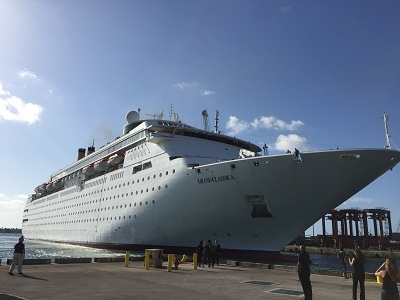 Bahamas Paradise Cruise Line, which launched its first cruise in early 2015, now has two ships — Grand Classica and Grand Celebration — offering daily trips to Freeport, Grand Bahama. BPCL CEO Oneil Khosa expects the cruise line to serve 500,000 passengers annually on the two ships. Joining Khosa at the ribbon-cutting ceremony was BPCL President Kevin Sheehan Jr. and officials from both Palm Beach and the Bahamas, places where the cruises have had a major economic impact. Originally built in 1991 for Costa, she previously sailed as Costa Classica and Costa neoClassica before joining the BPCL fleet. Evidence of its Costa heritage is seen around the ship. With the official launch festivities over, it was time to get our boarding passes and see Grand Classica up close before embarking on the inaugural two-night cruise to Freeport. By the numbers, Grand Classica boasts 10 decks and 658 staterooms with a capacity of 1,680 guests, along with 590 crew. There are 216 inside rooms and 430 oceanview rooms, along with two junior suites. The only balconies available come with the 10 suites on deck 10. * Restaurants. 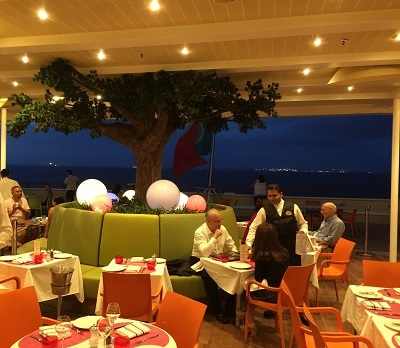 There are eight dining options onboard, including the main dining room, the Yellow Elder (named for the the national flower of the Bahamas). On Deck 10 you’ll find the Ocean View Buffet. There are two specialty restaurants — Admiral’s Steak and Seafood and The Rock Grill, featuring hot stone-interactive cooking. Slice of Pizza will fulfill your Italian fix while Grand Cafe has your after-dinner coffee. * Entertainment. The two-story Legends Grand Theater features Vegas-style shows. You can try your luck at the Par-A-Dice Casino on Deck 9 (we did, but luck wasn’t with us on this trip). The individual entertainers in the bar areas — on this trip a singer and saxophone player — were impressive. * The Pool. The main pool is located on Deck 11, along with the Plunge Bar. Aft we were happy to find the Oasis, an adults-only pool area and hot tub. You’ll likely find a lounge chair or cabana with your name on it. Additionally, there’s a jogging track on Deck 12, Kruzers, for kids 3-17, and the Indulgence Spa and Salon, along with a Fitness Center. If you want to shop, head for Lucaya Plaza on Deck 9. Our oceanview stateroom was located on Deck 6. 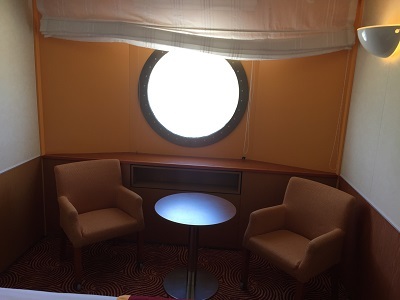 While we missed having a balcony, the porthole provides nice viewing, and after all, it is only a two-night cruise. We had plenty of storage space, including a decent-sized bath and shower. The colors were pleasing and the room itself surprisingly quiet. Tip: Be sure and pack a six-power strip or extension cord — as is the case on many ships, power outlets are in short supply. The cruise line’s bond with the Bahamas extends to names of the decks, such as “Bimini” (Deck 5), “Abacos” (Deck 8) and “Exuma” (Deck 10). Along with shore excursions, BPCL also partners with several hotels on Grand Bahama to offer combination cruise-and-stay packages. Guests can cruise to the islands, stay there, and cruise back. 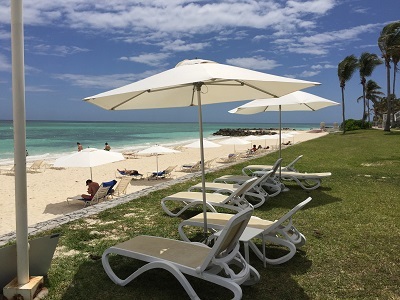 On our trip we visited Lighthouse Pointe at the Grand Lucayan, an all-inclusive slice of paradise nestled on a wide, white beach against an aquamarine sea. A walk on the beach followed by a cocktail — let’s just say a few hours wasn’t nearly long enough. 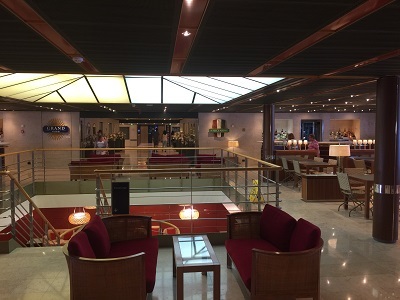 While they have a few minor glitches to work on, not unexpected on the first cruise out, Grand Classica delivers on value for those who want a quick getaway or may be cruising for the first time. As the only cruise line serving the Port of Palm Beach, they draw guests from not only South Florida, but also nationally and internationally. Rates start at $149 for an inside stateroom and if you go ask if they are offering their two-for-one special. It’s easy to see why BPCL brass are excited for the future. Great value plus a great vacation destination is a hard combination to beat. Coming soon: We’ll take a closer look at Grand Classica’s sister ship, Grand Celebration, and report on how the two compare. I just won a free cruise with this Cruise Line. I can’t wait to book it, looks like fun, I’m very excited!